Greetings again from the darkness. It is possible for a filmmaker to be “too close” to the material when undertaking a story that is somewhat autobiographical. 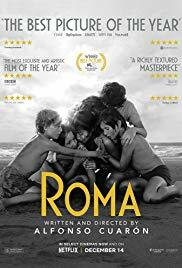 It’s also possible, in that situation, for them to catch lightning in a bottle and magic on the screen – and that’s exactly what writer/director Alfonso Cuaron has achieved with this look back at his childhood home life. In his follow-up to GRAVITY, for which he won the Best Director Oscar, Mr. Cuaron has dedicated the film to Libo, his family maid/nanny during his youth in Mexico City. Balancing artistry and everyday humanity like few other films, it takes us inside the home of a well-off family: Antonio (Fernando Gredigaga), the father-husband-doctor; Sofia (Marina de Tavira, the only experienced actor in the main cast), the mother-wife; Teresa (Veronica Garcia), the grandmother; the four kids; and two live-in maids, Adela (Nancy Garcia Garcia) and Cleo (Yalitza Aparicio). There is no separating the human emotions from the near-poetic art form of Cuaron’s movie. It is unusually quiet, filmed mostly at midrange, and with no musical score. Yet, in the stillness and quiet, so much is happening. The focus here is on Cleo. We hear many times how she is considered part of the family. Of course, she (and we) are reminded that’s only true to a certain extent as she is admonished for not cleaning up after the family dog or ‘wasting’ electricity in her living quarters by using the light in her tiny living quarters at night. First time actress Yalitza Aparicio brings a realism and accessibility to the role as the quiet, perpetually-in-motion maid/caregiver/nanny and she is mesmerizing to watch. Her duties include keeping the house clean, cooking meals, getting the kids up in the morning, getting the kids to/from school, and putting the kids to bed at night. What little scraps of time she has for a personal life are spent going on a date with the cousin of Adela’s boyfriend. Fermin (Jorge Antonio Guerrero) is a martial arts fanatic and just prior to their intimacy, he demonstrates his skills to her with a shower rod and literally nothing else. From a cinematic aspect, Cuaron’s film is a delight to watch – reminding at times of the classic Italian and French films of years past. Since his first film in 1995, Cuaron has frequently collaborated with (3 time Oscar winning) cinematographer Emmanuel Lubezki, but this time Cuaron wears multiple hats as writer/director/cinematographer/co-editor/producer. This is his movie – and his most personal one – from top to bottom. Working closely over the years with Lubezki has influenced Cuaron’s camera work … it’s stunning. He uses wide, initially static shots with slow pans – just the way we see in real life. And just like in real life, what he shows us is sometimes mundane and at other times various degrees of emotional. The remarkable opening credit scene could be quickly described as Cleo mopping the dog mess from the garage floor. But of course there is much more. We also see the reflection of planes flying overhead and hear only the sounds of everyday life. It sets the stage for the entire film. This is 1970-71 Mexico City, so in addition to Cleo getting the kids to and from school, the street riots – some quite violent – play a role, as does the incessant sound of dogs barking in the background. Cleo’s trip to the delivery room is filmed with real doctors and nurses, while a later trip to the beach offers yet another gut punch … and both sequences maintain the overall feel of authenticity. Lest you think this is just another “small scale” indie, Cuaron goes big a few times – the street riot, a mass martial arts training session, and the beach trip. His film is a story of class and family, making it more than just a thing of celluloid beauty. It also brilliantly captures the essence of life’s emotions: the “bad” with two men who ignore their responsibilities, the “normal” with kids being kids, and the “good” with seeing Cleo become such a vital and beloved part of the family. This entry was posted on Sunday, December 23rd, 2018 at 12:45 pm and is filed under Drama, World Cinema/Foreign. You can follow any responses to this entry through the RSS 2.0 feed. You can leave a response, or trackback from your own site.